Lucky for you, patience is not my strong suit. I made this recipe a while ago with grand plans to save it for the cookbook, but I really couldn’t keep it to myself any longer. Especially on Valentine’s Day. That would just be cruel. It all began when I saw an incredible looking cookie dough fudge on Pinterest. I immediately knew that I had to try making some, with my own vegan spin on it. However, I didn’t want to use confectioner’s sugar, butter, sweetened condensed milk, cream, white flour, corn syrup, or cups of sugar, so I decided to use my gluten-free chocolate chip cookie recipe as the base and tweak it from there. I knew with a bit of work, I could turn it into a more natural “fudge” recipe while maintaining the authentic cookie dough taste. 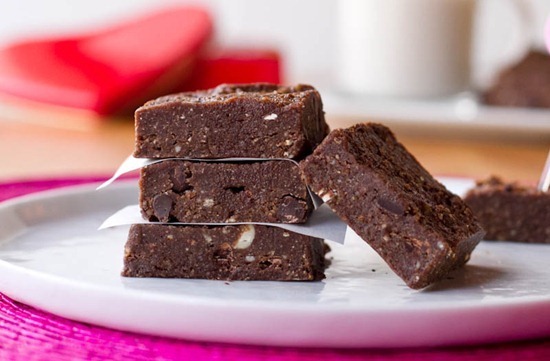 After a quick search for vegan fudge online, I also came across Sarah, Katie, and Kate’s vegan fudge recipes and used those for a bit of inspiration, adding coconut oil and a banana to the recipe as well. The first thing I did was heat the coconut oil, Sucanat, milk, and mashed banana on the stove top. I did this to melt the Sucanat so the fudge wouldn’t be grainy. Most of the cookie dough fudge recipes I came across called for icing sugar, but I figured I could cook down the Sucanat without having to resort to the processed white stuff. It worked beautifully! A healthier caramel-like syrup was born! I let this wet mixture stand on the stovetop, to cool slightly, while I prepared the dry ingredients. 1. Take 1.5 cups of oats and process it in the blender until a fine flour forms. Remove and scoop into a large bowl. 2. Now, add 1 cup of raw whole almonds into the processor and process just until a fine flour forms. It’s ok if a few pieces of almond remain. Be careful not to over process the almonds or it will start turning into almond butter and the flour will heat and clump together. If this happens, just use your fingers to push the clumps out. Or you can just use 1.5 cups store-bought almond flour. Mix in a touch of cinnamon into the flours and now pour in the wet mixture on top and stir well until the clumps of flour aren’t visible anymore. The cookie dough batter will be gooey and warm (since the wet ingredients were heated on the stove top), which presented a bit of a problem for my first trial. When I stirred in the chocolate chips, all of them melted right into the batter. This may or may not be an issue for you, but I wanted the chips solid for texture/appearance purposes. For my second trial, I chilled the batter in the freezer for 30 minutes before stirring in the chocolate chips. Much better. I wanted them solid for a nice texture, however, some of them still did melt a bit. It ended up being mostly chocolate chips with some chocolate swirl…perfect! Now all you do is spread this dough into an 8-inch square pan lined with two pieces of parchment paper. The dough will be very stiff and annoying to spread, so dip a spoon into water several times to help spread it out. You’ll eventually be able to spread it out smooth. Place it uncovered in the freezer for an hour and then it’s ready to rock your taste buds! Very important tip: It needs to be kept chilled to stay firm, but trust me, neither of us seemed to mind. Attention all cookie dough lovers! 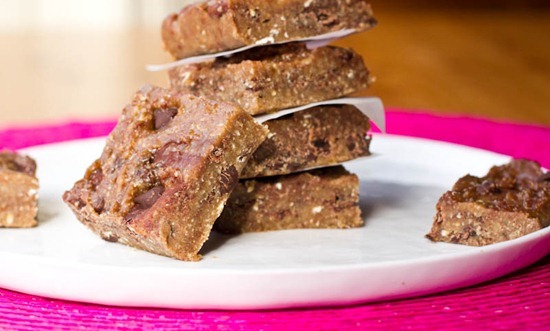 This fudge tastes just like cookie dough, but better. The sweet almond and oat base gives this dough a rich and buttery flavour, while doing without all the refined ingredients. I call this freezer fudge because it needs to be kept in the freezer to stay firm. 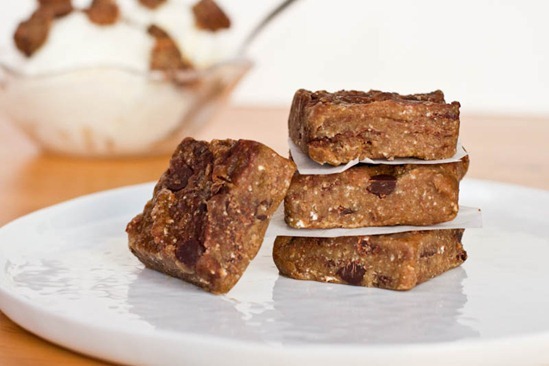 Slice it up into squares, store in an air-tight container, and you have cookie dough “fudge” whenever the craving strikes. To make gluten-free, just swap the oats for certified gluten-free oats. In a medium-sized pot, heat the coconut oil over medium heat. Stir in the milk and sugar and bring to a low boil. Immediately, reduce heat to low and stir for a couple minutes until sugar is dissolved. Stir in the mashed banana. Turn off heat and stir in the salt and vanilla. Set aside. In a high speed blender, blend the oats until a flour forms. Add to a large bowl. Repeat process for the almonds, being sure not to over-process them as you don’t want the oils to release. Add to bowl and gently break apart any almond flour clumps with your fingers. Stir in the cinnamon. Pour wet mixture over the dry mixture and stir well until no flour remains. Place bowl in the freezer for 30 minutes. Remove and stir in the chocolate chips. Line an 8-inch square pan with two pieces of parchment paper (one going each way). Scoop the cookie dough into the pan. Dip a spoon in water and spread it out until smooth. This dough will be very hard to spread, but don’t worry. Place in the freezer for 1 hour and then cut into squares and enjoy straight from the freezer. Store in the freezer in an air-tight container. Serving it with some vegan ice cream is also highly encouraged! Oh girl, there are just no words!! I’m in loooove…which is kind of appropriate today! Oh wow, this looks so delicious!!! I am glad you couldn’t wait to share with us! Making this asap! OMG yum yum yum! I for one am thrilled you’re low on patience this morning! Wow Ange, I’m always amazed by how you manage to switch up recipes to make them not only healthy but vegan too! This sounds delicious. Like you, I don’t think I’d mind if it was a bit soft. I probably wouldn’t have the patience to let the dough chill anyway! Happy Valentine’s Day! If I hadn’t made chocolate coconut brownies yesterday and still have 6 of them on my counter, I would be making this in a heartbeat today! Delicious! I think your first photo just made my Valentine’s Day. Ok, perhaps that’s a little over-dramatic, but then again maybe not… after all, it’s cookie dough! And then the last photo… you’d better publish that cookbook soon, or I might have to resort to eating the computer screen. Somehow, I don’t think this would do justice to your recipe ;). Oh Girl. Ohhhh girl. That looks… amazing? Divine? Like a stand in love for valentines day?? Unfortunately being at school I lack access to some of those wonderful ingredients as well as appliances, but I can dream. And earnestly wait for when I get home to whip them up!! On the topic of being at school, I saw on your old posts (pre-Vegan days) that you have a list of healthy snacks to keep around. Any veganized ideas? I find that most snack food (since it’s designed to last awhile) is either chock full of sodium, sugar, or both with little real nutritional value. Any tips would be appreciated. Happy Valentine’s Day to you as well!! Hey Michaela, My go-to snacks are pretty basic- lots and lots of hummus (im obsessed) with crackers, brown rice cakes, & veggies, granola bars (this recipe is easy/no bake: http://ohsheglows.com/2011/11/25/last-minute-protein-energy-bars-creamy-holly-nog-smoothie/ ) oatmeal squares (easy but you need an oven: http://ohsheglows.com/2012/01/20/on-the-glow-basic-oatmeal-squares/ ) fruit, endurance crackers & nut butter, green monsters, 5 ingredient almond butter chews (also no bake), etc. Hope that gives you some ideas! Can not wait to try!!! I’m a newfound vegan and you have made singlehandedly made this new transition quite easy to maintain. Thank you! Will definitely be making these for me and my Valentine tonight! Thanks for sharing! I’ve never been so excited to see a recipe where I know I’ll always have all the ingredients on hand! I’m making these tonight! Yum!! I don’t know how we are going to wait for the book!! I love desserts and treats straight from the freezer! Something about the crunchy cold texture is so appealing to me…. almost as appealing as a treat straight from the oven! Wow this sounds delicious! I love cookie dough and love having it on hand in the freezer so I’m pinning it for sure so I remember to make it. what a perfect v-day treat! this looks delightful! this looks amazingly delicious… especially for valentine’s day! I’m pretty sure I have all of the ingredients to make this…could be dangerous, especially since I just made vegan chocolate truffles! Angela, I just wanted to let you know how much I LOVE your website. I’ve been making your recipes for a while now, and I truly I’ve been having so much fun. I like getting into the kitchen and trying out you various ideas. I love the pictures, and your dedication. Your passion is truly inspirational. Thank you for doing what you do. I can’t wait for your book! These look amazing! Can I substitute maple syrup for the sucanat sugar? Good question. I’m not sure how well it would hold together, since you’d be adding more liquid and whatnot. I’m also not sure how it would freeze. With that being said, it might be a fun experiment. Please let me know if you do try it! You’d likely be able to omit the milk (since I only added it to thin out the wet mixture). Thanks for letting me know Christine! Oh. my. goodness. This looks SO GOOD!!!!! And I just so happen to have all the ingredients on hand….happy valentine’s day to me? Thank you for making me want to eat fudge first thing in the morning! 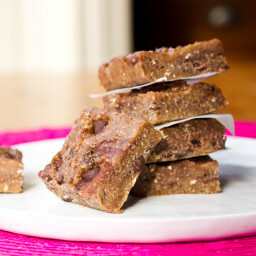 I love your approach to this recipe- fudge made with less refined ingredients sounds perfect to me. Yum, yum, yum!!! Love this! Oh my gosh, yum! I can’t wait to make this! Thanks Angela and happy valentines! I CAN.NOT. WAIT. for your cookbook!! I have everything i need to make this. And it will be heart shaped! On an unrelated note, did you switch to partial feeds or is this a glitch? I much prefer the full feed. Regarding the feed- My setting got switched on me when I updated the blog which is why you may have seen full text for a little while. I haven’t decided what format I’m going to use yet. I personally feel like my blog is best viewed on the actual page and I work hard on the visual aspect of it, so I’m on the fence with it right now. Love your blog and keep up the good work! Alright you convinced me, full text it is. Let me know if you see it now. Ooooh, this looks awesome!!! I’d want to eat it cold right out of the freezer!! Reminds me (slightly) of my new favorite treat- peanut butter and chocolate chip hummus. I know it sounds gross, but it tastes just like cookie dough and is so yummy with graham crackers as dippers. Oh my goodness, this looks absolutely delicious!!!! I started following your website a few months back, and everything I’ve tried has been amazing. Not just taste-wise, but I feel great too. 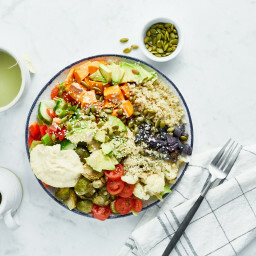 I’m new to the vegan lifestyle and right now I’m just experimenting with it, but your website has made cooking fun and I truly feel like a healthier person! I can’t wait to try this recipe!! You are awesome :) I have been making your recipes for the past few weeks and love, love, love them. I have conveniently forgotten to tell my meat loving hubs that they are vegan – he has been enjoying them as well!! Thanks for everything you do!! Thanks Heather, I’m happy to hear that! I always love when men can get on board with the recipes too. Your vegan cookie dough fudge looks fantastic, Angela! Glad my vegan fudge recipe could provide some inspiration. Which reminds me, I have some of it in my freezer right now… I think I need a piece! Love having treats in the freezer. Frozen treats don’t sit on your counter and stare you down. Instead they are little temptations that you can sneak from the freezer, little by little. They look delicious…and amazingly enough, I have all the ingredients on hand! They may just make my Valentine’s day menu. Just wanted to let you know, your posts are no longer showing up as full posts in Google Reader….. This is true and I, for one, read most of my blogs on my phone and will not click through (and have in the past unsubscribed). Just a FYI. I love your site and would hate not to have it in my reader everyday, but I simply refuse to take extra time to click through (especially on a phone). I came over to say A) this recipe looks amazing and I’m making it tonight! and B) I have the same feeling about the Google reader – I will click through, but I prefer to read it in Google reader. If you click “link” at the top of the post in Google Reader, it will expand right in your Reader. But I agree, I read a lot on my phone and don’t click through. 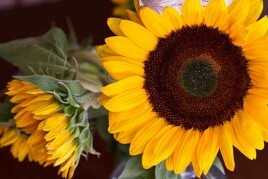 Love your blog Angela and have for years. Just wondering if you changed the setting or is it something from my Reader? Thanks for your feedback. 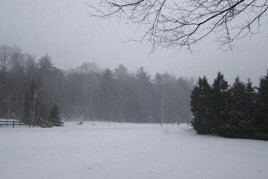 My setting recently got switched on me when I updated my blog (a reader let me know). I actually don’t use Google reader myself, so I wasn’t aware that it even happened, or what my “normal” setting was even set to. I will certainly take your input into account. I have mixed feelings about it because I do believe that my content is best viewed on the actual page, but I also realize that it’s convenient for many who use rss. Ok I just checked it out and switched it to full text. Can you let me know you see it now? These look SO good! I recently found out I am allergic to gluten, dairy and SUGAR! :( Total bummer cuz I love my sweet treats. BUT I am glad to know so I can continue my journey to feeling well. With that said, do you think I could swap the sucanat for Agave, honey or maple syrup?? Delicious! “Raw” cookie dough is such a treat. I made my own raw batter with sunflower seeds, dates, goji berries, and cacao. You’ll want to lick it right off the spoon. Happy Valentine’s Day! Happy Valentines Day, and thanks for sharing! Just wanted to share in case you wanted to give it a try! Holy moly that looks insanely good!! However, this girl has an island vacation in her near future so I should probably wait. If I had that in the house I would eat it for breakfast, lunch, and dinner…willpower is not my strong suit. Happy Valentine’s Day! Yum!! Can’t wait to try it. And eat it. (Hopefully not all of it)! OMG! I am going to make these right now for a Valentine’s Day treat tonight! Happy Valentine’s Day! I am going to go and make this right now for when Hubby gets home tonight! YOU ARE THE BEST! Amazing!!! I cannot wait to try this and have it waiting for me in the freezer. I don’t always use Sucanat as a sub. It’s a bit tricky to work with sometimes as it can be “drying”…in this case, it worked wonderfully. PS. 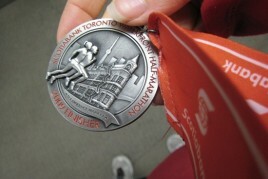 I just started my training for marathon today! went well! i need to write a post about that progress! This needs to happen in my kitchen! Do you think you can use a different oil in place of coconut oil? I used coconut oil because it chills solid (which is what I wanted) so I’m doubtful that another oil would work. You might be able to get away with Earth Balance or even coconut butter. These sound awesome! And I love that they are healthier. I hope you are having a wonderful Valentine’s Day! Happy Love Day, Love!! Ok, can I rock these out with Stevia somehow???? I need need NEED this in my freezer. Seriously!! Whoa, this looks amazing!! Thank you for not waiting to share this!! well THESE look outrageously good. mm mm cookie dough is my weakness! Oh my gosh, that looks so good. My daughter always asks my to make vegan cookie dough for her ice cream. I am going to have to try this. When’s this book coming out again?!! I have a random question also – when you put your chai seeds in your smoothies, do you just dump them in or mix first with a liquid then add? I just bought chai seeds (yay) What are some other uses for them besides in smoothies? I just dump them in :) Usually milk, then chia, powder, greens, then frozen fruit to weigh it all down. wiping drool off my keyboard right now. i am trying to figure out how i can make this while cooking dinner tonight as well. . . . lol. thank you for another awesome recipe. I can’t wait to make these!!!! Is sucanat the same as cane sugar? I read your blog through google reader and it just started coming out in snippets rather than the whole article. Have you done anything to change how the RSS feed works? Also, in mind of getting ready for spring planting, I just ordered seeds from Landreth Seed Company, it’s one of America’s oldest companies and carries a huge variety of heritage seeds, which I thought you might be pumped about. Hope your spinach doesn’t bolt on you again this year! btw they do have some bolting resistant varieties in their catalogue, which I was keen on after seeing what happened to you last year. Funny. We must have fudge on the brain for Valentine’s Day. I just put a vegan peanut butter chocolate fudge recipe on my blog today. I’m afraid it is not so virtuous as your recipe though! Now THAT looks delicious – I can’t wait to try it! These look SO fabulous!! I actually have all the ingredients bar the banana and am seriously considering making them now. I totally want to try this with cashews or peanuts (can’t have almonds). They look delicious! Angela, this is perfect! Today is my birthday and I told my friend I would find something healthy and vegan to make because she was stressing about birthday dessert. I just found it! Why?! You should’ve saved it for the book because now I’m forced to make it and gobble it all up!!! This really does look so darn good and easy to make. My kids will go crazy for it too. Great recipe!! These look delish! I may have to make these for my vegan husband this weekend! Oh yum this looks delicious! I used to love eating the cookie dough almost more then the cookies when I was little! Holy Yum, these look so amazing. Too bad I rarely bake..another sign I NEED to start. I make all of your other recipes and they are so divine. My MIL recently sent me a KitchenAid 5 Qt Stand Mixer. It’s a beauty but I have no idea how to use it!! If you can point me to some of your recipes, I may have to plug it in!! Thanks, Angela. Your recipes are the best!! Oh. My. Vegan. God. I cannot WAIT to try this recipe. Yay for freezer recipes! I still have a couple of pieces of your no bake chocolate torte in my freezer… yummm :) That last picture is taunting me, I can’t wait for your cookbook to come out! Have a great Valentine’s Day Angela! oh my – how very delicious! Happy Valentines Day Angela! YUM! Does the banana flavor stand out or does it mellow out in the mix? I love banana but sometimes I don’t like the flavor it takes on “in” things. You can taste it only slightly in my opinion. The banana flavour would be more pronounced with a very ripe, brown banana probably. Oh Angela! You are a girl after my own heart! Your focus on nutrition AND giving in to one’s sweet tooth … makes me love my visits here so. Can’t wait to try this. Also, for what it’s worth, I’ve subbed coconut oil for Earth Balance in several of your recipes (the almond butter rice crisp treats are the first ones to come to mind) and it’s always been a great substitution. That’s great to know, thanks! spectacular! and vegan too, I just am so impressed and love knowing that. :) thank you for treating us so great! HAPPY V-DAY!! I can not wait to make these. My toddler son would love this, but he can’t have almonds. 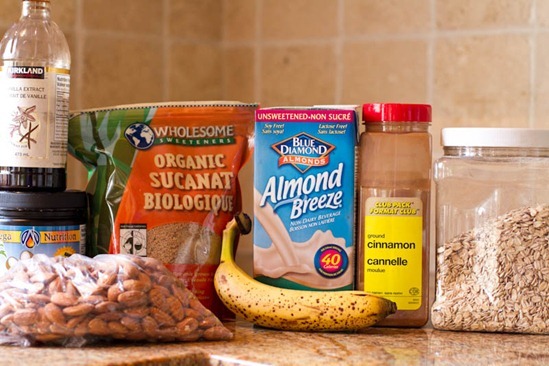 The almond milk is a simple substitution, but any ideas for the almond flour (gluten-free preferred)? Thanks! Hey Stephanie, I’d probably be inclined to just use the same amount of oat flour in place of the almonds (so maybe just double the oats?). It won’t taste as sweet/nutty, but I’m sure it would still turn out quite tasty! Yeah! This post couldn’t have come at a better time! I was just thinking about how much I wanted cookie dough! Clearly, you read my mind. :) I’m thinking we’d make great Cranium partners! ha. Anyway, I have a weird non-food question I was hoping you and some of the other Oh She Glowers could help me with. I’m really trying to find some vegan face products (make up/lotion etc) do you have any that you just love or can recommend? I have been on about every website possible and I’d hate to spend the money and not like it. Thank you! im on a quest for natural skin care products as well. Sadly what ive tried has been fairly disappointing this far. id love to hear if anyone else has suggestions for good products! I’m still on the hunt for a great all natural facial cleanser, and a tinted moisturizer etc. On another note, I made this fudge last night as a Valentine’s treat and my boyfriend and I loved it! Thanks Angela! Currently I am trying 100% Pure face lotion and eye cream and love them so far (it’s only been a few days). I have heard nothing but good things about their company and everywhere I look its sold out so that’s a good sign! I use Cetaphil bar soap as a wash but am thinking I’ll switch to Kiss My Face bar soap once Cetaphil runs out. I also researched some natural make up products and have heard good things about Alima Pure. Their website (www.alimapure.com) is great! I was able to order some samples for really cheap to see if I like it before I buy it. I havent gotten them yet so I will keep you posted! Hope you had a great Valentine’s Day! I can’t wait to try the cookie dough fudge! On top of ice cream is the best idea! these look great! must try this coming weekend! Thanks for the sweet treat! recipe! WOWZA. I love cookie dough anything. Serving that with vegan ice cream sold me 100% – that is an amazing idea! And I love that it’s freezer friendly too, so you don’t feel you have to eat it all in the few days following making it – I like fudge just as an occasional treat. Thanks Ange! Happy Valentine’s Day! I hope you’re having a great Valentine’s Day! I came across a recipe the other day and was wondering if you could make it vegan and your own touch (which I am sure you are totally capable of, but are you INTERESTED in doing this?)? Scroll down the the Apple Muffins. OMG MUST MAKE RIGHT NOW. Pardon Me!?!?! Can you deliver this to my house RIGHT NOW!?! Yummmm – cannot wait to make!! Hurray! I had all the ingredients on hand, they came together quickly and easily, thanks to your leg work! What a terrific way to enjoy a sweet valentine’s treat. My 3rd grade students sweetly brought many ‘samplers’ to class, but this is the one I am diving into tonight! This looks amazing! Especially on top of the ice cream! By the way, I made your no-bake chocolate oatmeal cookies the other night and they were SO good. Can’t wait to try this recipe, too! My mouth is watering. Way to go making it healthier and vegan. It looks even better than the original! Happy Heart Day! I just made these… this recipe is genius!!! Do we really have to wait til 2013 for the book to come out???? So excited!! Glad you enjoyed it Bridget :) Thanks for your support for the book too! mm that sounds good, I’ll have to check it out. I loooove mushrooms. It’s definitely lucky you’re impatient :) What a great creation. And I would definitely like mine from the freezer! Delicious! I was so impatient to try this one out, I totally overlooked the part about freezing the dough before folding the chocolate chips into it…so I added some cocoa nibs for texture and now have chocolate explosion fudge, yey!!! Big thank you, from one Ang to another! Yes! Jackpot! I have all the ingredients! I’m making these! Hope you had a great Valentine’s Day!!! These are my FAVORITE kind of recipes!! I am wondering if you could use stevia and cut down the sucanat…may have to give it a try! I enjoyed ice cream with raw brownie crumbles last night…mmm mmm! :) Have a great day! These photos are amazing and drool-worthy. I am a cookie dough fiend. I can’t wait to try this! I’m mad…bc now I won’t be able to stop eating. I made these last night (nothing better to do, I suppose) without the chocolate chips and turbinado sugar instead of sucanat. Mine kind of came out with a pronounced banana flavor and more like a peanut chew texture than fudge. Though it wasn’t what I expected, it’s still delicious, and those 32 pieces (now 30) will be my little sweet treats for a while. 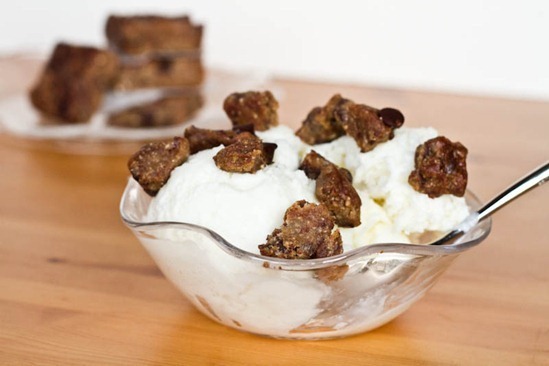 I think that pretty much does it for me…vegan cookie dough…with (r)ice cream. yummmmmm……. omg im making this tonight! do you think it would work with cashews? This looks amazing! 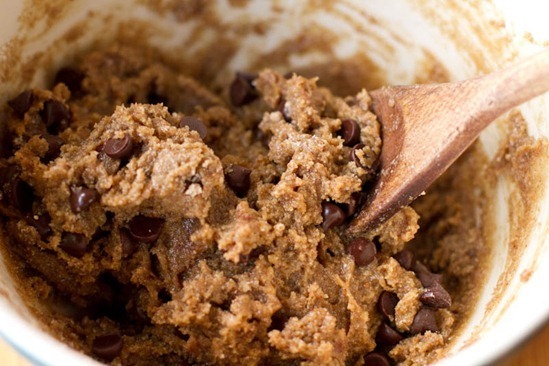 I love cookie dough, especially when it’s healthy and vegan! Definitely gonna try this recipe out. Angela, can I just use store bought GF oat flour instead of grinding the oats myself? If yes, how many cups of oat flour should I use? I am going to try to make these for my daughter’s school’s bake sale. Do you think they will hold up outside of the refrigerator for the whole day? Hey Shilpa, No they definitely wouldn’t hold up outside of the freezer/fridge…they get extremely soft. Sorry about that! As for subbing oat flour, I’d probably use 1.75-2 cups? Just popped these in the freezer. The only problem I had with this recipe is that I ate 1/2 the batter before it made it to the freezer! Yummy! Hi Angela, I have a question. I just made this recipe and I am not sure I did it right. I followed your instructions exactly, except that I used brown sugar instead of sucanat (I actually used a bit less than 3/4 cup and didn’t pack it.) My batter came out slightly drier looking than yours, and when I spread it into an 8×8 pan, it didn’t look thick and bar like, like your photo. It is in fact very thin and barely covered the bottom. The only thing I can think that I might have done wrong is that maybe, in an effort to not accidentally make almond butter, I didn’t grind the almond quite fine enough? It was a bit more like coarse corn meal texture than flour. I absolutely love your blog! 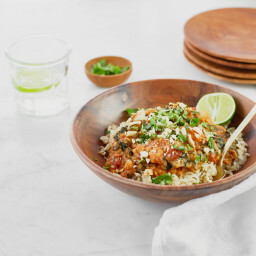 I am a long time stalker but first time poster..I have a question about this recipe-would it be ok to sub Earth balance or a different oil for the coconut butter? 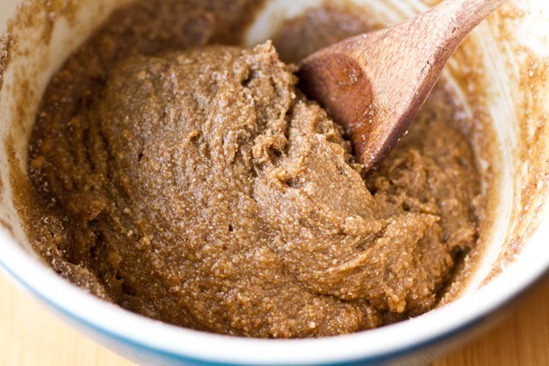 I’m a college student so coconut butter is a little out of my budget range since I would rarely use it, so I am just wondering if I would totally ruin the recipe with a different fat base. Anyway, I LOVE your recipes and blog!! Hey Sydney, I think you might be able to get away with subbing the coconut oil with Earth Balance, however I haven’t personally tried it out myself. Let me know if you attempt it! Another awesome recipe!!! I made this in less than 10 min and had to stop myself from eating it all. Love, love, love it! A big THANK YOU for this one! Do you have any suggestions on what to use in order to replace the ground up almonds for someone who is allergic to nuts? I would probably just use more oats, and maybe a touch more sweetener, since the almonds provide a nice sweetness. Any ideas for substituting the banana for those who are can’t eat them? I keep thinking about this recipe, but I have a question. Do you use regular dark chocolate/dark chocolate chips, or only those that are labled as vegan or dairy-free? Lots of products, such as dark chocolate chips, seem vegan from their ingredients list but then have a little disclaimer saying they could have been processed on equipment that processed milk. What are your thoughts on those labels? Hands down the most creative recipe I’ve seen all week! YUM! These looks sooo tasty – and got to love swapping out the Earth Balance stuff for good ol’ fashioned coconut oil. Is there anything better than cookie dough in the freezer?! omy! just made this. unfortunately, my food processor broke, so the almonds and oats didnt get as ground up as I’d like… but cant wait to eat. in the freezer now!!!! Oh my word! This recipe is Amazing! (I did substitute peanut butter for the almonds.) However, I’m not sure I would consider it healthy- they are way too addicting! :P thanks for sharing! 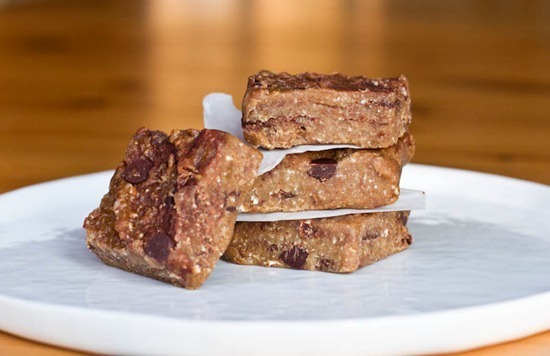 I just made these – they taste great but unfortunately my puny food processor doesn’t grind the oats and almonds fine enough and they’re a tad gritty. They still taste delicious though! And I LOVE the caramel mixture – I’m already daydreaming about other things that I could use it for! Reduce the sucanat and use it as a pancake topper? Using the caramel as an ice cream topping once it’s cooled a little? Ooooh! This looks divine – my friend made the recipe this past week and thought it was delicious. I’m wondering – do you think you could swap the banana for applesauce? im really not sure! Let me know if you end up trying it. Thank you for this recipe. I dont have coconut oil but i do have coconut butter. Do you think i could melt the butter and use it instead? Oh, this is a good one!! Just made these and they’re delish! I’ve always had a love affair with Ben & Jerry’s cookie dough icecream, and these would be perfect for creating my own vegan version! I don’t usually prepare vegan cookies, but these really look great. Especially when they are served with ice cream. Nice work. I just made these and they are simply amazing! Thank you for posting! Just made this about an hour or two ago. I reduced the sugar by just 2 tbsp, reduced the oil by 3 tbsp to 2, and used 1-1/2 bananas :] worked awesome! Oh, and because I don’t have any chocolate chips on hand, I just put in 1/4 cup cocoa powder. glad to hear that kathy! Angela, do you think I could substitute regular flour for the almond flour and possibly add some almond extract? I have a Vitamix and could grind the almonds but only have a wet blade so I didn’t think I could use it for grinding nuts… Advice? Thank you! Lauren, I too have a vitamix and didn’t think it would work to grind the almonds but it worked great! I am in the process of making these right now! I have an oat allergy so I substituted rice krispies and it seems great so far. The mixture tastes amazing so I’m sure they will be delicious. Oh my goodness. I just made this, froze it, and i am currently enjoying buttery, rich, chewy, sweet fudge. I think my favorite part about being vegan is the many variations/recipes of cookie dough! This may be gone within the next few days….. I can’t wait for your cookbook! oh yeah, i forgot i added only 1/3 a cup of agave for sweetness and it came out great. Glad to hear that Laura! Made this last week (without the chocolate chips) Love how just a small square is oh-so satisfying! WOW these look amazing! I think we are going to try and make them with coconut sugar instead of the sucanat :) Has anyone else tried this? ahoy! these look absolutely delicious! though this vegan has a small snag – I’m (very unfortunately) allergic to nuts and the almonds in this recipe would not do me good. any suggestions for a substitute to the almonds? thank you! Im not sure Laura, I would suggest reading over the comments to see if someone else tried a nut free version! Just made this for the first time. Although the batch is currently in the freezer for at least an hour, I had some of the “batter” and it tasted amazing!! Just like cookie dough! I added the chocolate chips a little too early and most of them melted (sad) but I got a cool marble effect. yikes, I will add that into the directions. Glad you are enjoying it so far! Another tried and 100% approved this week. I’m going to make some more to add it to ice-cream this weekend. We are not vegans but live with intolerances, and I’m always on the lookout for yummy healthy recipes. This one is amazing! Hey Isa, Im happy to hear that you enjoyed the fudge! I will for sure be trying some in Banana Soft Serve this summer. Banana Soft Serve, that’s another one I want to try. I have printed the blizzard one too. When my (second) son saw it – he loves the Dairy Queen ones – he said: oh can you make those today? I’m a bit of a late commenter but I have a question that I don’t think was asked. I have a tree nut allergy, therefor I cannot eat almonds nor anything derived from them. Can I use anything in place of them or, are they needed for the ingredients to combine? I don’t think switching out the almond milk for rice/soy/cocconut milk will be a problem. I just wanted to thank you so much for posting all of these wonderful recipes! I recently made the switch to a whole-foods based diet with no animal products, and was starting to get pretty discouraged until I found your site! I love cooking, but it’s been hard to switch from the “meat-and-a-veggie” dinners I’m used to making without becoming a pasta and potato hound (not so good for the waistline!). You have no idea how much you’ve helped me, and I can’t wait to try everything on your site! Thanks again! Made these with the kids today to keep them busy on a rainy afternoon and i had to force them (like actually yell!) to put them in the freezer, because they just kept spooning the dough. Wow, these are amazing! 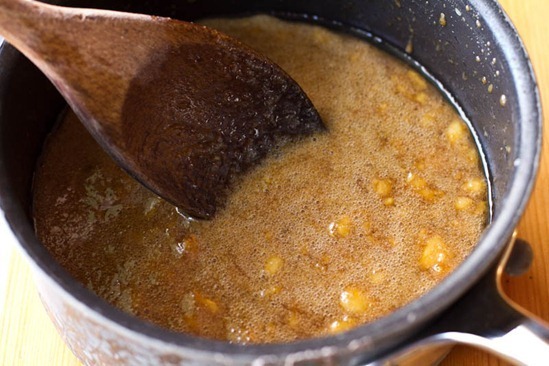 Have you ever used the caramel syrup in another recipe? I was wondering how I could turn it into maybe a cake icing (perhaps adding silken tofu or something to thicken it) or about just chilling it and swirling it into some homemade vegan ice cream made from coconut milk. Thoughts? I made this (with coconut sugar instead of Sucanat) for a potluck and it was a hit!!! So good. Thanks for the recipe. Thanks Emily! enjoy the cookie dough…it’s yummy! Hello! Just wanted to say that I made this recipe (except I accidentally forgot the milk) and it tasted DELICIOUS! I used 1/2 cup maple syrup and 1/4 cup brown sugar. And I added raisins into the mix in addition to chocolate chips. I am making this for a school project. If i make them the night before then put them in the freezer will they still be okay for the next day or will they be took frozen/soft (I will be keeping them in a freezer at my school during the day). Hi Emma, They should be served straight from the freezer, so as long as they dont sit out too long they should be fine. Enjoy! Wow, very excited to make this delightful treat!!! I think I may add walnuts for I love the taste and texture of crunchy things. So glad to have stumbled upon your site and cannot wait to explore so many yummy things. Thanks for sharing. After having these on Pinterest for too long, I finally made them. Delicious! I kept eating the batter before they were even in the freezer :) I will be making these again. Thank you! Oh, wow. I used brown sugar. And man, that wet ingredient mixture is just IN CREDIBLE. Like gourmet sea salt caramels with gooey banana. I could pour that over anything. Ho-ly-crap. Not to mention the fact that the finished product is great! I love your recipes because they are consistently delicious, incredibly creative, easy to prepare, healthy (of course), most of them seem to be good for making a big batch and eating all week, the pictures are great, the blog posts are fun to read.. you just rule!!! I just finished up the last of your falafel and tahini lemon dressing (my go-to-favorite-amazing-eat-by-the-spoonful dressing). Thanks for all the incredible recipes!!!! As I didn’t have sugar of any kind, I did have 200-240 grams of dates , I boiled them in a bit of water, made them soft and mushy and omitted the banana ( as i got the consistency and thickness already) , followed the recipe as called for and they turned out amazing everything held really well. My friends couldnt believe there was no sugar in them , they loved it! 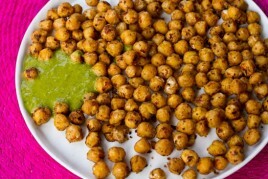 Would hazelnuts work in place of almonds in this recipe? These are DELICIOUS! I made it with agave/maple syrup, and 80/20 with almonds to cashews and it was so good! addicting really-had to put it in the freezer so I wouldn’t eat it all. Actually, I don’t know if I would call this “fudge.” But, I would call it YUMMY!! I’m going to be making this again. Genius! This was so easy to make and, OMG sooooo good! Tasted just like cookie dough ice cream…but better! Absolutely LOVE these! I’m so late to this party. My husband and I devoured them over just a few days … I didn’t have a ripe banana so I used banana organic baby food … worked really well actually! Could I replace the sucanat with coconut sugar? First of all LOOOVE your recipes! Second, is 1.5 cups oats different from 1/5 cups oats? How much is 1.5 cups oats in grams in this recipe? I have to convert all your recipes in grams and its frustrating. 1.5 cups means 1 and a half cups of oats, not one fifth cups. Hi Miruna, thanks so much for the recipe love! To answer your question, 1.5 cups=1 ½ (one and a half) cups — I’m sorry, though, I don’t have the conversion to grams on hand. Hopefully that clarification helps!